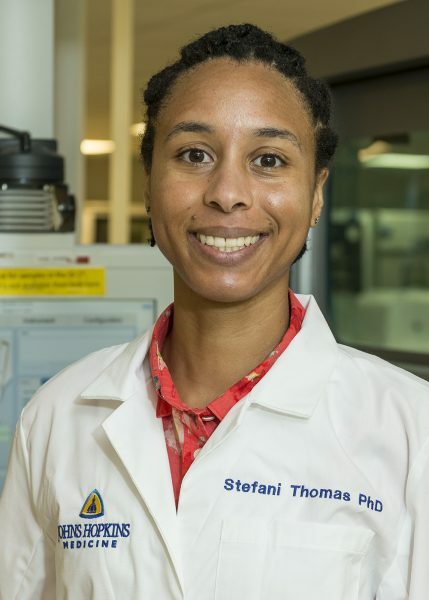 Dr. Stefani Thomas is the Daniel W. Chan Clinical Chemistry Fellow in the Pathology Department of Johns Hopkins Hospital. Born and raised in Los Angeles, California, Dr. Thomas graduated from Dartmouth College with B.A. in biological sciences and a minor in music. After working for a year as a lab technician, she entered graduate school at the University of Southern California. Three years into her graduate studies there, her advisor moved the laboratory to the University of Maryland. For the sake of the continuity of her research of altered protein-signaling modules in Alzheimer’s disease using mass spectrometry-based proteomics methods, Dr. Thomas made the cross-country move to Baltimore. After earning her Ph.D. in pharmaceutical sciences, Stefani worked as the manager of the University of Maryland’s Greenebaum Cancer Center Proteomics Shared Service for four years. Seeking more experience in academic medicine with translational applications, Dr. Thomas joined the laboratory of Dr. Robert Cotter in the Department of Pharmacology and Molecular Sciences at Johns Hopkins University in 2012. After Dr. Cotter’s untimely passing, Stefani joined the Center for Biomarker Discovery and Translation (CBDT) in the Department of Pathology at Johns Hopkins as a research associate to apply discovery and targeted proteomics methods to elucidate the biology of ovarian cancer and analyze proteins derived from alterations in cancer genomes and related biological processes. Intrigued by the CBDT’s role in the Division of Clinical Chemistry, and inspired by the strong impact that the Division’s director, Dr. Daniel Chan, has had (and continues to have) in the fields of clinical chemistry and clinical proteomics, Stefani embarked upon her journey to become a clinical chemist by pursuing a clinical chemistry fellowship, and was chosen to be the Daniel W. Chan Fellow. Motivated by the increasing prevalence of mass spectrometry in the clinical laboratory, Stefani recently joined the Clinical & Laboratory Standards Institute’s (CLSI) Quantitative Measurement of Proteins and Peptides by Mass Spectrometry C64 Document Development Committee. She also serves as co-chairperson of the Washington-Baltimore Mass Spectrometry Discussion Group. Stefani and her husband spend time enjoying the arts in Baltimore and volunteering with several social service agencies. Stefani is also an accomplished dancer who has performed with Coyaba Dance Theater and Bmore Houseful at the Kennedy Center, Artscape, the National Museum of African American History and Culture, the Baltimore Museum of Art, and other venues throughout the DC/Baltimore area.